The lower costs and smaller environmental footprint of tiny houses have drawn a growing movement of people seeking to dramatically downsize their living space. But standard building codes have made it difficult to legally build one. Late last year, a group led by a tiny-house entrepreneur in southern Oregon got the main building code organization in the US to approve a code specifically for tiny houses. It’s a major milestone for a movement that’s struggled for legal recognition. But it turns out it may be years before the changes take effect. Andrew Morrison and his wife Gabriella operate a tiny house consulting business out of their hand-built 207 square-foot home near Ashland. Morrison says the lack of building codes specific to tiny houses has hindered the movement because applying standard codes to a super-small house often doesn’t work. Code requirements for stairs, sleeping lofts, appliance clearances and more have also stymied would-be tiny house owners. So, last year, Morrison became part of a team that wrote a new building code section. “We basically were looking at creating a building code that was specific to tiny houses that would allow for adjustments in things like ceiling heights and other things that would impact a tiny house versus a standard house,” he said. The group went to Kansas City, where they successfully lobbied the International Code Council, which adopted their proposal. At a December meeting at the public library in Ashland, Morrison shared the good news with several dozen tiny house fans. He told the crowd that after the vote for approval, a building official approached him and told him how remarkable an accomplishment it was. The new code is welcome news to Ben and Tera Bristow. The young Jackson County couple sees a tiny house as their best bet to be able to afford their own home for themselves and their three-year-old son Nathan. They’re working to buy some land where they can put a tiny house. Tiny houses have long inhabited a legal gray zone. Many tiny house enthusiasts have tried to get around the code issue by building on trailer frames and calling their homes “recreational vehicles.” Others have simply built illegally and hoped for the best. Now, as the new code section gets adopted by jurisdictions around the country, people building tiny houses will have a blueprint to follow that passes legal muster. But in Oregon, at least, that state approval could still be several years away. Oregon’s residential building code is reviewed and updated every three years. The window to submit proposed changes for the 2017 review ended last September. 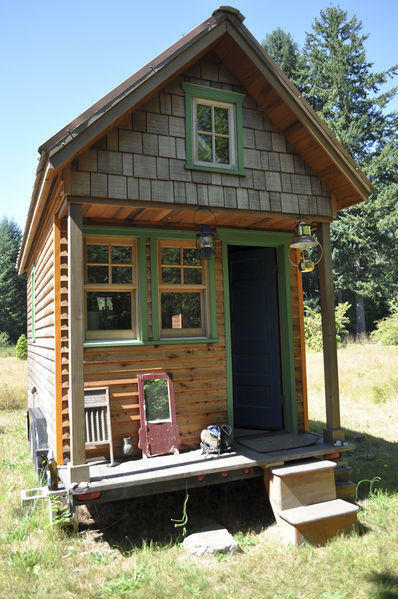 So, the new tiny house code section – which was approved by the International Code Council in December -- won’t be a part of Oregon’s current code review. That means the next opportunity to adopt it in Oregon won’t be till 2020, at the earliest. For Representative Phil Barnhart, that’s too long. “Waiting another four, five or six years for this kind of an amendment stalls what is a movement that is available right now in Oregon to actually get a lot more people housed,” Barnhart said. The Democrat from Eugene says his main interest in tiny houses is as a way to provide shelter for homeless people. But he recognizes the wider interest in the economic and environmental benefits of tiny homes. So he’s sponsored House Bill 2737, which would do much of what the International Code Council’s new tiny house code would do. He thinks the simplest way to get this done is to speed up the process. Barnhart’s bill is currently being reviewed by a legislative work group. The group includes a range of stakeholders, including officials from the Oregon Building Codes Division, who declined to be interviewed for this story. Andrew Morrison and other tiny house boosters in the work group hope state building officials can be persuaded to get behind the new code and put it into effect as quickly as possible. CORRECTION: In an earlier version of this post, Rep. Phil Barnhart was incorrectly identified as being from Springfield. He is from Eugene.